Meghan Markle wowed onlookers when she arrived at Royal Albert Hall for a performance of Cirque du Soleil’s “Totem” on January 16th! 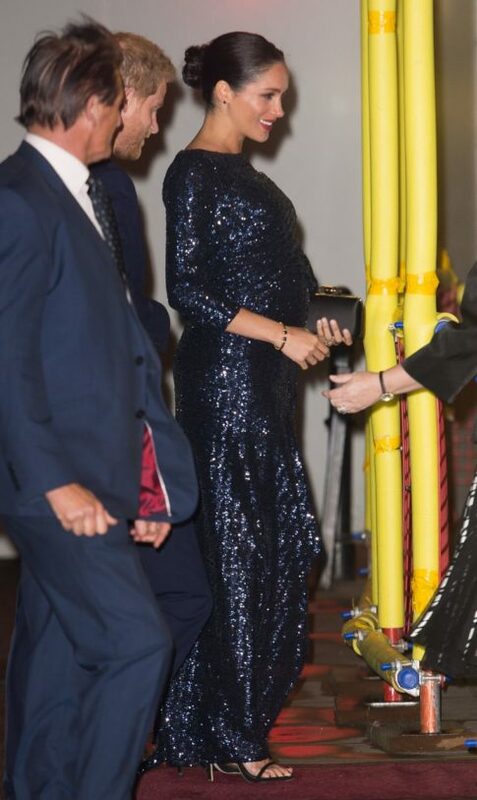 The mom-to-be stepped out in a navy sequin gown by Roland Mouret, a designer she’s worn multiple times over the last year. This particular dress featured her now signature boatneck neckline, a nice slit to show off her slim stems, and a fitted bodice that elegantly highlighted her growing baby bump. Her exact dress is actually still available for purchase here, but it’s a whopping $5,595! If you don’t want to spend that much, I found this nearly identical style for $600. Still expensive, but it’s a GREAT dupe and a fraction of the price of the Roland Mouret gown. She let the dress do the talking and kept her accessories minimal – a chic black satin Givenchy clutch and Stuart Weitzman heels. I actually have the exact same shoes she’s wearing in two colors – they’re so flattering and look great with pants and dresses alike! Pretty comfortable for such a high heel too… highly recommend. I loved her beauty look this particular evening too! Since the dress is a showstopper, she kept her hair simple in a sleek bun. For her makeup, she opted for a berry lip and sultry smokey eyes. She’s glowing, that’s for sure! Shop her exact look + similar pieces to recreate the look for less below!